The music of Ann Southam is a bit like the drawings of Leonardo Da Vinci: Just as the Italian Renaissance master never seemed to tire of sketching a particular object, like a human hand or churning water, over and over again, so the late Canadian composer frequently continued to explore a single fragment of musical material in seemingly countless guises. 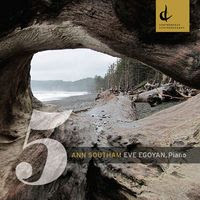 As such, the five haunting piano solos by Southam that constitute “5,” a new recording released by the Canadian Music Center, are probably better thought of as the five connected movements of a single large-scale work rather than a handful of distinct compositions. Upon first listen, there’s not much that distinguishes the pieces, which were discovered in Southam’s house following the composer’s death in 2010, from each other. They are all meandering in tempo, brooding in mood and basically consonant in tonality. A foreboding thread of dissonance runs throughout each track. But upon closer inspection, the movements reveal distinctive qualities, following on from one another like the way shadows change as the sun crosses the sky, or tides move in and out from the shore. Pianist Eve Egoyan masterfully manages to retain the overall consistency of style across the five pieces composed from a 12-tone row while drawing our attention to the subtle changes that disrupt the ever-steady pulse of the left hand drone and right hand chords. Harmonies become lush and expansive at one point, only to shrink to a single basic chord later on. Pauses appear in the texture breaking up the flow of the musical line, and then mysteriously recede. A definitive major cadence contrasts with the ambiguity of an unresolved chord. All of these barely perceptible shifts work together to create a musical experience that is at once beautiful and unsettling. A lot of times it's challenging to get that "perfect balance" between user friendliness and visual appearance. I must say you've done a superb job with this. In addition, the blog loads very fast for me on Opera. Excellent Blog! to take a look when I get home. I'm surprised at how fast your blog loaded on my cell phone .. I'm not even using WIFI, just 3G . but I know I am getting know-how every day by reading thes pleasant articles or reviews. the timе by гeaԁing theѕ fastidious articles or revieωs. You are so awesome! I do not think I've truly read anything like that before. So wonderful to find someone with some original thoughts on this subject. Seriously.. many thanks for starting this up. This site is one thing that is needed on the internet, someone with some originality! to unravel my problem. Maybe that's you! Having a look forward to look you. using WIFI, just 3G .. Anyways, fantastic blog! Remarkable! Its actually remarkable post, I have got much clear idea regarding from this piece of writing. therefore it's pleasant to read this web site, and I used to pay a quick visit this weblog every day. reading it, you will be a great author.I will be sure to bookmark your blog and definitely will come back at some point. Very energetic post, I lоνеd that bit. Will there be a рart 2? inside the "Women seeking Men" forum? loan it is possible to expect. a surprise that men and women utilize this kind of credit often, but it is true. have really loved surfing around your weblog posts. After all I'll be subscribing for your feed and I hope you write again soon! Link exchange is nothing else but it is simply placing the other person's weblog link on your page at appropriate place and other person will also do similar for you. I've found something which helped me. Many thanks! Asking questions are actually good thing if you are not understanding something fully, but this post offers nice understanding yet. interested until it's one thing to do with Girl gaga! Your personal stuffs great. At all times care for it up! Hi there every one, here every person is sharing these experience, therefore it's good to read this web site, and I used to visit this weblog daily. I visit day-to-day a few web sites and sites to read content, but this weblog offers feature based articles.